The Ferry Building Tower lights are going out. As part of the centennial celebration of the 1915 Panama Pacific International Exposition (PPIE100) the illuminated “1915” lights on top of San Francisco’s iconic Ferry Building Tower will be extinguished to mark the exact date of the closing of the 1915 World’s Fair. On Friday, December 4th beginning at 4:15 p.m. several hundred World’s Fair admirers, dignitaries and historians, many dressed in period attire, will be entertained by San Francisco ragtime singers as the lights atop the Ferry Building Tower are turned off, just as they were at the conclusion of the World’s Fair one hundred years ago. In addition to entertainment, guests will see a spectacular bi-plane from the era fly by the Ferry Building just as it did 100 years ago, along with a Hollywood-style spotlights. The Bi-plane will be flown by “Diamond Bob” Berwick of Coastal Air Tours. 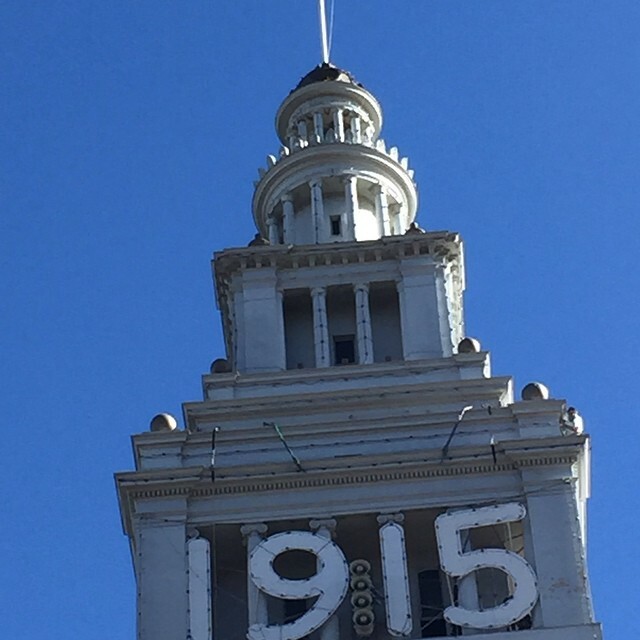 The specially created “1915” numbers were placed on the Ferry Tower in early March to commemorate the start of the 1915 World’s Fair when more than 19 million people came to San Francisco. The event is FREE and open to the public. The first 500 individuals to arrive at the event will receive a PPIE100 candles. While the Ferry Building lights are going off, the PPIE100 celebration will continue throughout the Bay Area early into 2016. One of the highlights of the Centennial starts on Dec. 16 when the San Francisco Ballet celebrates the centennial of the Panama-Pacific International Exposition with its production of Nutcracker, which is set in San Francisco in 1915. There are also continuing exhibitions at the California Historical Society; The San Francisco Conservatory of Flowers; the San Francisco Public Library; The Bancroft Library and the de Young Museum. Learn more about these and other PPIE100 events and activities at www.PPIE100.org.